"From the first page, I knew I was in good hands. This is my kind of fantasy -- magic, adventure, and gorgeous writing. 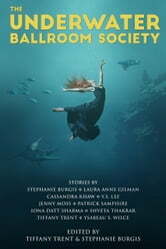 The Underwater Ballroom Society is the kind of fantasy that got me into reading fantasy." Ysabeau S. Wilce, "The Queen of Life"
Iona Datt Sharma, "Penhallow Amid Passing Things"
Jenny Moss, "A Brand New Thing"
Cassandra Khaw, "Four Revelations from the Rusalka Ball"
Laura Anne Gilman, "The River Always Wins"
Shveta Thakrar, "The Amethyst Deceiver"
Patrick Samphire, "A Spy in the Deep"